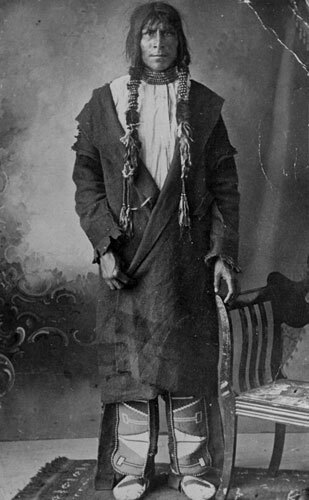 Almighty Voice was born in 1875 near Duck Lake, Saskatchewan. He grew up on the One Arrow Reserve, where he heard stories of his grandfather One Arrow, who had resisted taking up his reserve until 1879. On October 22, 1895, Almighty Voice was arrested by the North-West Mounted Police (NWMP) after being accused of slaughtering a government cow. While he was transferred to the jail at Duck Lake, one of the arresting officers is said to have joked that the penalty for killing a government cow was hanging. Almighty Voice seemed to have taken the joke seriously: he escaped from jail that night,and fled to his mother's home on the reserve. Initial attempts to capture him were not successful. On October 29, 1895, NWMP officer Colebrook caught up with him near Kinistino, and in the attempted arrest was shot and killed by Almighty Voice. By April 1896 there was a $500 bounty on Almighty Voice; however, he avoided the authorities until May 1897. On May 27, 1897, it was reported that Almighty Voice and two companions had shot and wounded a local Métis scout near Duck Lake. The NWMP under Inspector Allan came across Almighty Voice at the Minichnas Hills, a few miles from the One Arrow Reserve. There was an exchange of gunfire, and Allan and another officer were seriously wounded. Another force made up of both civilians and NWMP officers attempted to rush the three men, but again they were turned away by gunfire. On May 30, after heavy gunfire including rounds from a nine-pound field gun, Almighty Voice, his brother-in-law Topean and his cousin Little Saulteaux were all found dead.